Favicon or Site Icon is the tiny image that appear next to your website title in the browser. It helps your users identify your website and more frequent visitors of your site will build an instant recognition for that tiny image. This increases your brand recognition and helps you build trust among your audiences. In our article about most common WordPress mistakes, not adding a favicon was among the top 25. In this article, we will show you how to add a favicon to your WordPress blog. Why you should Add a Favicon to Your WordPress Site? Most users usually have many tabs open in their browser window. This hides your website’s title as the number of tabs increase. The favicon helps user identify your website and quickly switch to the tab they want. You can ask your users to add your site to their homescreen on mobile devices. Your site icon or favicon is also used when a user adds your site to their homescreen on a mobile device. You can use your brand’s logo as your site icon or favicon. The recommended size for your site icon image is at least 512 pixels in both width and height. The site icon image should be a square, you can use a larger rectangular image and WordPress will allow you to crop the image when you add it. We recommend using an image editing program like Adobe Photoshop or Gimp to create a site icon of exactly 512×512 pixels. This way you can maintain exact proportions for your image. You can use transparent image or fill the image with a background color of your choice. This image could be in png, jpeg, or gif format. Since WordPress 4.3, you can add a favicon or site icon from WordPress admin area. Simply go to Appearance » Customize and click on the ‘Site Identity’ tab. The site identity section in customizer allows you to change the site title, description, and control whether or not you want to display them in the header. It also allows you to upload your site icon. Simply click on the select file button and then upload the image you want to use as site icon. If the image you are uploading exceeds recommended size, then WordPress will allow you to crop it. If it matches the recommended size exactly, then you can just save your changes. That’s all you can now preview your site and see your favicon in action. You can also visit your site on a mobile device and then from the browser menu select “Add to homescreen’. You will notice that your site icon will appear on the homescreen. Upload your favicon to your website’s root directory using FTP. After that you can simply paste this code into your theme’s header.php file. Replace wpbeginner.com with your site’s URL and you are good to go. 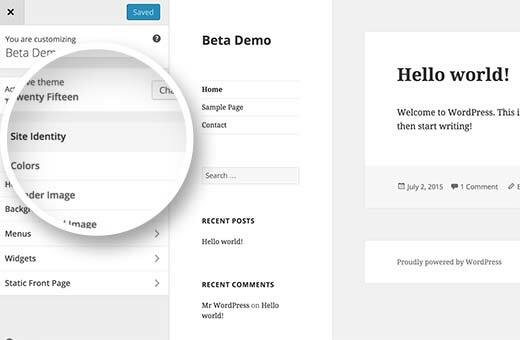 If your theme does not have a header.php file, or you can not find it, then don’t worry we have a plugin for you. Install and activate Insert Headers and Footers plugin. After activating the plugin go to Settings » Insert Headers and Footers and paste the code provided above in the header section and save your settings. If you don’t want to deal with FTP at all, then you can also use the plugin called All in One Favicon. We hope that this article helped you add favicon to your WordPress site. For questions and feedback you can leave a comment below or catch us on Twitter. Great ! I always go through from your tutorials when ever i get stuck in any kind of issue. Thanks for it. Can’t Add a Favicon to Your WordPress Website? That was my problem. I did a fair bit of research where I finally found my issue. It was because the PHP GD Library was not enabled. Fortunately, I control my own server. I had upgraded the server PHP to v7.2 but I forgot to enable the PHP GD library. So…if you find when you try to add the site icon in the appearances section of your wordpress admin and the image you upload/select is not being accepted or you can’t use the crop image feature it is most likely because your webserver host has not enabled the GD Library. This tutorial was wonderful! Thank you so much for the great work! Were you able to figure out how to fix it? “When I go to the “Site Identity” tab, there is no place to upload a site icon. The only option I have is the “Site Title”. That’s ALL! I guess, the WP theme you are using doesn’t have favicon implemented. So, if it is not declared in theme functions.php file, it won’t appear in admin/editor side. You can hardcode it to header.php or use third-part plugins. Hi, I recently updated my website from HTTP to HTTPS and when that happened, the site icon stopped working. Does this mean that somewhere along the line I’ve missed a step? I’ve tried changing the image and reuploading a new one and that hasn’t worked. If someone types in the website URL using http then the old favicon (and not site icon) shows up, but the minute it’s https, then it disappears. The site icon though is visible when I’m logged into the dashboard. I’m on HTTPS and I have the same issue, did you find a solution? Favicon only shows when I’m logged in in admin mode! When I go to the “Site Identity” tab, there is no place to upload a site icon. The only option I have is the “Site Title”. That’s ALL! I am using WordPress 4.7.3. It really helped, more grease to our elbow. Can anyone tell me how this new “Site Icon” feature is supposed to work? I get to the point where the file is uploaded and I get a dialog box that offers to crop the image. The problem is 1) my image doesn’t need to be cropped and 2) there’s no “Save” button (or “Done” or anything similar), only a “Crop” button and the upper right corner X to close the dialog. If I click “Crop” I get an error (Error cropping this image, bla bla bla) and if I hit the X it closes. Either way, my image is not saved as a Site Icon (even though it is saved in the media library. After deleting the image, resizing it to exactly 512×512, I upload it again. This time, no crop dialog, just the “Select” image dialog. I click select, the image has a box around it and a check mark and nothing else happens. No Save, etc. When I close the dialog, there’s still “No image selected.” This happens in Chrome AND Firefox. I’m ready to throw WordPress away and hand code everything. I haven’t used WordPress in a couple of years and I’m frustrated with what seems like buggy, poor design and feature bloat. Why does it need to be 512 pixels for an icon? I’m hoping it’s converted somewhere inside WordPress, once and done, and not on every load. 512×512 is crazy for something that would very rarely be bigger than 32X32, unless I am missing something? Article not useful. Everyone tells you to make a path to your favicon & that’s it. However do you include http: www http do you specify .ico .png? Nobody says anything in detail. But it creates 10 different versions of the site icon image in addition to the original at sizes of 32×32, 100×100, 150×150, 180×180, 192×192, 250×250, 270×270, 300×300, 360×360, 500×310. Why so many cropped images if only 4 linked to? Also, I submit an icon image sized 512×512 as recommended, but the 500×310 version is always cropped so the top and bottom of the icon is cut off. Is there any way around this and/or is it a big deal? What browser support does this WP Site Icon cover (mostly in respect to how far back in IE)? In Whatsapp, the image which appears left to a link address if you send a link: is that the same icon? Because I don’t see it there. Marieke, It’s featured image, you upload to a particular post. The ICO Format plugin for Adobe Photoshop does not allow images more than 256 pixels high or wide. So how do you create one that’s 512px??? It doesn’t need to be made an .ico. Just a plain .png or .lpg will do when you work in WordPress. Informative instruction. Now i following your tips and tricks. Thanks for sharing it. Kindly tell me any website or a software from where I can make an effective favicon for my site in a quick time???? Thank you for another simple to follow tutorial. I’m a true beginner and y’all do a great job explaining things in a way I can understand. Thanks, glad you find our tutorials helpful. how come my side identity menu doesn’t have the service for site icon? I am so frustrated… can you help ? Are the instructions you give here theme-specific? I’m using the Delicacy theme, and it doesn’t give me that option to alter Site Identity and insert a Favicon. No it is not theme specific. Make sure you are using the latest version of your theme. Hi There, I also don’t see the site identity tab, I am using the sketch theme, how do I update a theme? You might not see the word “favicon” probably site icon. If you see a scrow bar you might have to scrow all the way down to see the select image box. You can add favicon by WordPress’ “Costumize” editor, which can be found in every wordpress site. I upload a PNG file that is exactly 512×512 pixels, WordPress saves it, and then I end up with a cropped image in my media library. Super annoying! WordPress 4.4. I should add that the new, cropped image is exactly the same dimensions as the original I uploaded, but now I have two in my library (albeit one has been processed twice, and has actually increased two kilobytes in file size!). I have gone through the directory, exactly as you described, but my Site Identity tab only has “Site Title”, “Tagline”, and a checkbox for displaying header text. How can I fix that? Or do I have to go the FTP route? thank you so much, very simple way love it. Wow! That was so easy with the newer version of WordPress. Doesn’t work. When I got to Customize > Site Identity, the site icon option doesn’t show up – it only says “Site Title” and “Tagline”. Hi same is the problem I am facing and I am using the website of wordpress on my laptop for building up my blog! I’m having the same problem. I’m using wordpress directly online, I haven’t downloaded anything. No “site icon” option at all. It took me forever to figure it out!!!! Yay! It worked perfectly and the instructions were super easy to follow. Thank you so much! I added a 512×512 pixel jog image via Site Identity / Site Icon. The image appears just fine there. But the image does not appear as a favicon in any browser (Firefox, IE, or Chrome). I’ve done all the steps. The image shoes in the customiser but not on the site on any platform…iphone or on my iMac in any of the browsers. Is there a specific file type? Site icon feature supports PNG, JPEG, and GIF image files. This doesn’t work on my site. I’ve got the icon the correct size, but it’s not showing up. Perhaps it’s because of my custom URL? Is this option to alter Site Identity and add the Favicon theme-specific? I don’t have that in my self-hosted site. I am so glad to have stumbled upon your article. I had quit trying to figure out how to upload my favicon in the past because it felt impossible. But recently, I felt the need to take another stab at it. You made it so easy! I can’t recall it being this easy to upload before. I have a question, recently, I’ve used the plugin All in One Favicon. I uploaded my picture but it doesn’t show up if I’m not logged into WordPress, it just keeps on showing the HostGator favicon (regular), can anyone help? Here’s a stupid question: Why do they make it so complicated? This should be something that you can do in a couple clicks, like adding an image to a blog post. Actually, there is a feature currently in testing which will allow users to add favicon from theme customizer. I have a logo which I want to use. Is that possible? It is not in a square format at this point, but can be. How do I do that? Can I “create” one in iPhoto (on a Mac)? Where would I do that in iPhoto, and how? I have one on my dashboard now. Can I drag that somewhere? How do I save it as a PNG file? Where do I do that? This is a nice general site to understand what a favicon is, but not on how to do it. Hi Bert, I’m still feeling my way around this process myself but I am ok up to the point you are trying to reach. Creating your own or editing an existing logo to make it fit can be done in a program like Photoshop. Remember to go to New file, and set the size to 16×16 pixels. Import your image to this and reduce it to fit. If you don’t have Photoshop or any other image editing software you can go to where the instructions are easy to follow. I’m sure it doesn’t necessarily have to be a PNG file. But it does have to be an .icon which the Favicon site will convert for you from the original .jpeg you uploaded. Because I have Photoshop when I clicked on the Edit button in iPhoto it automatically opened Photoshop. See what it does when you do it on your system. It may open an alternative editing method. Hope that helps. I know what it’s like as a beginner. Thanks man.. your site has been useful to me and also your videos on youtube. am still working on my site.. you can have a look. Can i add Meta description and meta keyword for my site using this plugin. what is this apple touch icon??? Thank you, this kept it simple and gives me a way to use this. Now, question: This will show a favicon for every page correct? What if I want a different one for each page? I managed to add the favicon without the background image. But when I move to another tab on the browser, the background image shows up. For example- if you look up the favicon is perfect. But, when you are on another tab, you will the white background show up. Any advice would be highly appreciated! Thank you! Simply add this line in your header.php at any where before tag. and upload favicon.ico to root folder of your website. Root folder where your wp installed, do not upload favicon.ico to sub folders. Refresh your browser one or two times your ico will appear on tab. This definitley fixed the problem, and changed the favicon on all pages, EXCEPT the home page! Why could that be?? Help please! And thank you!